This page contains a few links to websites related to the KPNQwest/Ebone disaster. I am not related to Ebone or KPNQwest, with the exception that I am working for one of their customers. This is only to show my support to the Ebone Noc! This is the last update of this page. As of July 19th, the rest of the KPNQwest network is running unattended, meaning that the last people at the Service Management Center in La Hague left the offices. Some parts of the network are still operational due to the fact that they have been bought by the local management or other companies. You can find an overview of the different network and it's status aswell as the official update form the KPNQwest people here. A local archive can be found here. Although the complete Ebone IP and Transmission network has be turned off, some parts of the KPNQwest backbone are still running and carrying traffic. This is most likely due to the fact that some of the local KPNQwest country organisation have taken over the local network. The Ebone network has been deactivated! For those not in the know yet : Yesterday, we received news that the deal with Oakley didn't go through. Everything was ok except for one thing : the banks demanded Oakley to pay 45 million euro to keep the Ebone network running for another couple of weeks while Oakley was prepared to only give 25 million. At around 20:00 last evening, the last people from the NOC left the building and today a few people have gotten a contract to shut down the Ebone network. I don't know how long this messageboard will remain up as it's hosted on a PC in the NOC, but I just wanted to tell people this personally before all the newssites start spreading it around. I would like to thank everyone that has supported us over the last couple of weeks on behalf of all my colleagues who've been keeping everything running, hoping on a miracle : you were great. To my colleagues : Thanks for the great time I had working at Ebone and I hope everything turns out ok for you and that we may meet in the future in another company. It's been great, but now the show is over and the curtain falls over one of the best companies I've ever worked for. Speed aka Stephan Persoons, ex-Ebone Shift Manager, signing off. The discussions are still going on...in the meantime, the Noc guys left the NOC, and will continue to work only if they get new contracts. It is obvious that a decision (good or bad) is very close! According to the Ebone Noc people, the discussions are still ongoing with an interested party to take over Ebone as a whole. After AT&T withdraw their offer, the administrators did also refuse the 200M EUR bid from Trimoteur for KPNQwest. Monday has come, but there is still no decision. Looks like next Monday (01/july/2002) will be an important day. I've been in contact with the Venture Capitalists tonight. They are behind the only bid which would keep the Ebone network complete, with Operations remaining in Brussels. They are very optimistic that there will be few obstacles in the way of concluding the deal to buy Ebone on Monday. The Ebone Noc people are preparing plans to sepearte the KQ and Ebone AS's right after a possible deal. The situation has calmed down again. The people in the NOC are not yet ready to give up. As a consequence, the network is still doing fine. Ebone NOC people have had no such order yet and will not get one like that before Monday at least. We've had a mail from one of the last remaining (top) managers saying that we should keep working as normal during the weekend and that during the weekend probably more information would become available. Also was said that this would probably speed up the process of negotiations for a possible takeover by another party. Dear all, there is absolutely NO SHUTDOWN planned for Ebone and after talking to KPNQwest in NL, there is no shutdown of the KQ network planned either. Don't get confused with KQ and Ebone networks. If you heard about Alcatel threatening to shut down the network, it's the KQ one. Not the Ebone one. No worries for that. Don't believe all the rumors. Some people are very good at gossipping about things they don't really know about, just for the scoops. 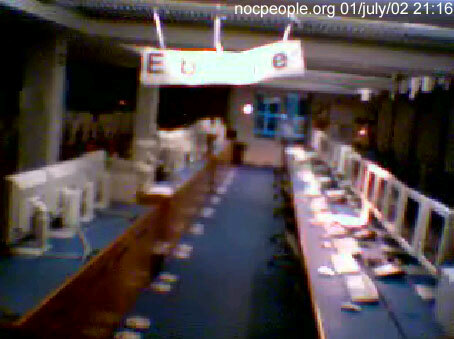 Ebone is still there, up and running, with 40 people maintaining the operations and the network. Keep the faith, on my Netcool screen, there is much more green than red lines. Thanks for the update Laurent! And again: New problems ahead?? Total Telecom is writing about another threat in this article. Apparently some of the money, promised by customers, which is needed to keep the network running has not yet arrived. Total Telecom writes in an article today, that Alcatel demands 15Million Euros by Tuesday evening. This could have as consequence, guess what, a shutdown of the network if not enough money is left to finance the day to day operations. After many long days for the people at the Ebone NOC (aswell as for their customers) the finally were able to come to an acceptable agreement. 200 persons (40 among the working in the NOC) will be paid during 2 weeks, giving enough time to find a solution for the pople and the network. We are pleased to announce the hard-line strategy of the Union-led volunteers at Ebone in Belgium appeared to have finally reaped rewards. Sufficient funds have been provided to maintain operations throughout Europe. This vital capital will be used to cover operational costs for 2 weeks. This includes the salaries for 200 people, of which 40 people will be from the Belgian Operations Centre. During this time, we are very confident of reaching a positive outcome to the negotiations which are continuing to find a buyer for the Ebone network. It can therefore be confirmed that the now passed deadline of 17.00 C.E.T. for a network shutdown, will not be executed. A further press release will follow in due course. The following link has the information that a solution has been found today in the evening (Thursday) for 40 persons in the NOC. Apparently contracts for these people over 5 weeks have been approved. But I don't have a confirmation until now if this is the case or not. And my Dutch is not that good aswell ;-) Especially since the Article has been published at 20h38 CET, I don't think this agreement has been finalized. Additional info from the Ebone NOC people can be found here. Although everything was looking fine until recently, things are truning out very bad again! The following message has been send out to customers in the evening (Thursday). It says very clearly that the network will be shutdown on Friday (14/june/02) evening at 17h00 CET if no solution has been found until then. The reason of this is due to the fact that, although the trustees raised enough funds to pay 40 people during the next two weeks to keep the network up, this money is not available. Meaning that all the promises are yet again apparently worth nothing. And even the bravest and most motivated people have limits somewhere. We can only hope, for the sake of the customers and the people working at the Ebone NOC, that a real solution can be found in a VERY short period of time. The liquidators do not plan to continue to run the network after July 1st, if no buyer can be found until that date. According to several sources several telco's or investor groups are interested in byuing the whole or major parts of the existing infrastructure. One of them is the irish operator eTel. The KPNQwest trustees succeeded to raise enough funds to keep the network up at least until July 1st. Read more here (FT). Although this is very good news for some Ebone/KPNQwest customers, the battle is not yet won for the Ebone employees. 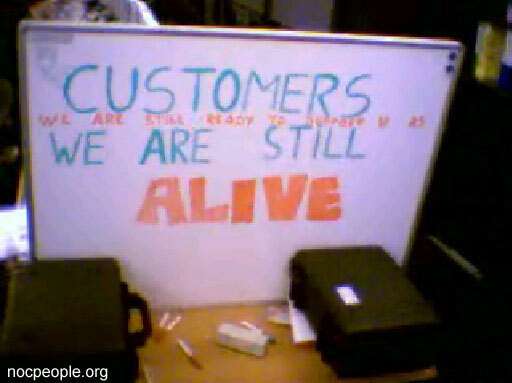 Since in the end this is just giving those customers the necessary time to move away from the Ebone network. According to information on the employees web-forums, the rest of the Noc people have been fired today aswell (06/june/2002). A lot of them are staying in the Noc and try to keep the network running and keep customers up. But nobody knows how long that will be possible. Discussions in the afternoon (06/june/2002) with Unions and some people from the government were not successful.